Although Christmas is, on paper, a time of peace, love and celebration, the horror genre has been attached to this holiday since long time ago. For writers and directors Rebekah and David McKendry, setting a horror movie precisely during Christmas Eve was a decision that came to them naturally. "We’ve always loved Christmas. Halloween is our favorite holiday and Christmas is definitely second. We’ve always noted that some of our Christmas decoration looks sinister, like a little bit too happy. It’s kind of the same thing that people find clowns terrifying... so cheerful it’s almost sinister”, said Rebekah during an interview with ScreenAnarchy. In Rebekah and David's All the Creatures Were Stirring (now available on DVD, On Demand and Digital Video), one of the universal themes is the conflict of feeling lonely and down during Christmas time. "We always thought that horror films are one of the best vehicles to explore social issues, and being alone on Christmas and the feeling that that inhabits, is where we decided to start the film: when two people [played by Ashley Clements and Graham Skipper] realize that they are both alone on Christmas Eve so they decide to spend it together, not really knowing much about the other person, just out of desperation of having to spend Christmas Eve with someone”, revealed Rebekah. These characters decide to attend a peculiar play to entertain themselves on Christmas Eve and at the theatre in question, each time the curtain rises, we experience a segment of what it is as well a straight horror anthology. 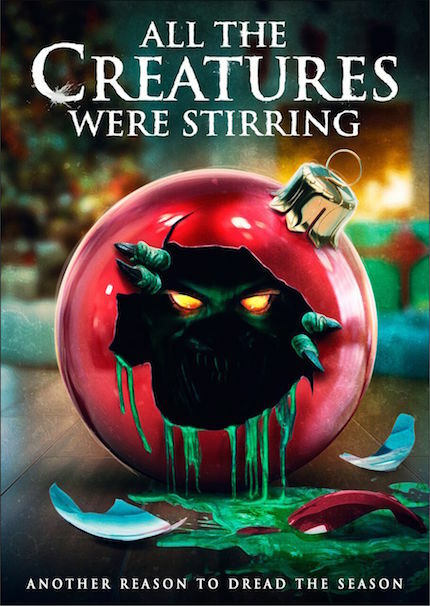 All the Creatures Were Stirring offers five different Christmas horror stories (with a dose of comedy), from a office gift exchange that becomes a Saw-esque deadly game, a last-minute holiday shopping that may also involve a demonic curse, a twisted version of Charles Dickens’ classic A Christmas Carol, a revenge tale featuring one of Santa’s reindeers, to even some science fiction stuff that references the infamous cult movie Santa Claus Conquers the Martians. "I grew up watching some of the weird Christmas specials. We wanted to pay homage to a lot of styles that we love and grew up with in the eighties, like Joe Dante, and that’s pretty much what we did. I think with this film we had so much freedom to do what we wanted”, asserted David McKendry. "We knew that we wanted each segment to feel and look incredibly different from the prior one, we didn’t want them to have the same feel, we didn’t want them all to be horror comedy, we didn’t want them all to be scary, we wanted them to be a really great mix. One of our big challenges was just trying to make sure that we had a lot of variety. Like the final segment, which is kind of our The Twilight Zone-ish one, is a little bit more campy than the rest. With the reindeer segment we were incredibly heavy stylized with how we filmed it, so you had to be really creative and innovative with that. We knew going in that we wanted one to lean on Italian horror, so our reindeer segment has a lot of nods to giallo films. We watched Torso, Inferno, and a bunch of films like that”, added Rebekah. And what about some horror movies to enjoy during Christmas time? "We watched a lot of Christmas horror leading up to All the Creatures Were Stirring. I’m a big fan of Rare Exports. Gremlins of course. We love Black Christmas though it’s not a comedy by any means, I also really like Christmas Evil, and I would watch any of the Silent Night, Deadly Night films", concluded Rebekah McKendry.